Techies Sphere: How to avoid unexpected VMs reboot? How to avoid unexpected VMs reboot? Or, Common causes of unexpected reboot of Virtual Machines. 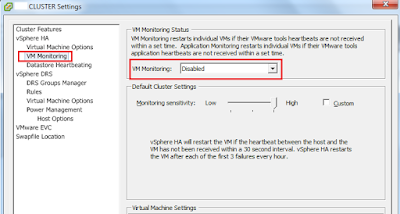 Or, Why to disable “VM Monitoring” in VMware vSphere Cluster setting? Imp Note: Hey Guys, I have seen sometime that Virtual Machines are getting rebooted automatically and when you check Windows event logs, it will show you that the last reboot of the server was unexpected. Definitely, there are multiple factors which can cause Unexpected Server reboot but I would suggest checking few Settings on your VMware Cluster as well. One of the factor that I have seen is, If you have enabled VM Monitoring Setting of the VMware Cluster, this will reboot your VM servers whenever VMware tool heartbeats are not received within a set time. Likewise, another component of VM Monitoring is Application Monitoring, which also cause VMs to be rebooted unexpectedly if it not receives the VMware tool heartbeats within a set time. 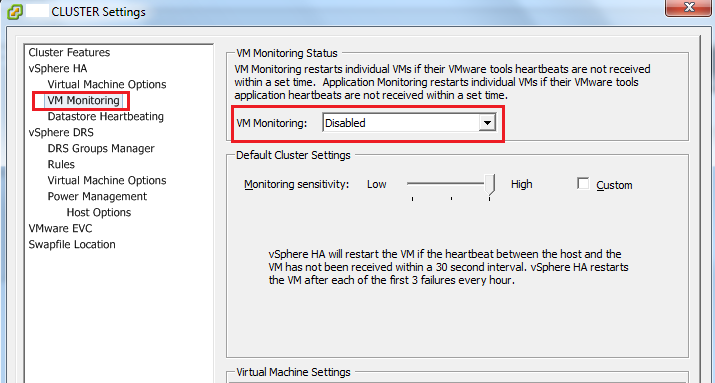 Its good to go ahead and disable the "VM Monitoring" option in VMware cluster.